Yet another metaphor for entrepreneurship. There are endless metaphors for starting and running a business, and I'd like to throw another one in the pile: pinball. Yes, that game that older millennials like myself, along with gen Xers and baby boomers grew up playing in arcades, pizza parlors and movie theaters can be tied to entrepreneurship. Here it goes: You have your startup funding that you invest in the business/game. You launch (works for both here). Then it's all about balancing the ball, or business, while facing many obstacles and distractions -- bumpers and ramps can be thought of as employees and competitors. Letting your ball fall to the bottom three times means you're out of business and have to launch again. A nice thing about both business and pinball: you can try again at both, provided you have the money and passion. Don't just take my word for it. Jody Dankberg, director of marketing and licensing of Stern Pinball, the 30-year-old company that recently unveiled machines featuring Aerosmith and the '60s version of Batman, agrees with me. "A really good pinball player can make a quarter last a long time -- you can get extra balls," he told me at the company's booth at CES 2017. "It's a lot of pressure." Stern's primary business is creating and selling pinball machines, but it doesn't limit itself in this now digital world. The company has games you can play on mobile devices, video game consoles and on virtual-reality headsets. 2. Get your brand out there. I certainly didn't expect Stern to have a presence at the digital-heavy CES. But, as Dankberg explained, "At CES, we're surrounded by all this virtual and augmented reality, but this is reality. It's grounded, and an experience you can't find anywhere else." The strategy worked, since you're reading about Stern Pinball here. USA Today listed it as one of its five CES showstoppers. 3. Treat your partners well. 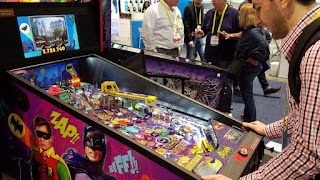 Pinball is great, but what makes the machines even better are awesome tie-ins, like the aforementioned Aerosmith and Batman games. Stern works with some of the largest brands out there, from Spider-Man, Game of Thrones to The Walking Dead. "We're fortunate to have a really cool product, and a lot of our partners are excited about it," Dankberg said. "Movie directors tell us that you know you've really made it when you have a pinball machine." But it's not just a one-way street. Stern listens to suggestions from its partners (he mentioned the members of Aerosmith are big fans of Pinball), Dankberg said. "It's fun to get out of our ivory tower of design and thought and collaborate with other people."